Detroit, or the world, has never produced an automobile that rivals the muscle cars of the 1960’s and early 1970’s. They were big, powerful and wonderfully unrefined. No one would call them sports car in the traditional sense. They were not nimble and curves were dangerous at most any speed. However, what they lacked in sophistication they made up for in brut force. In many ways the GTO’s, Mustangs, Road Runners and their brethren represented the American character better than any vehicle past or present. Simplicity, dependability, strength and singularity of purpose were their calling cards. No one could confuse the purpose of these beasts. It was plain for all, and it was straight-line performance for one quarter of a mile. Nothing else mattered. Contrast that with today and the lore of days past becomes even more apparent. A new Corvette will defeat even the most powerful Corvette of old in every category. The current generation of performance cars thumps the muscle car in safety, comfort, reliability and, yes, performance. But, that does not tell the whole story and it doesn’t explain the current interest in and corresponding sky rocketing values of classic muscle cars. The clarity of purpose these super cars exuberated just feels good. It awakens the cave man in each of us! These automobiles have a particular hold on the generation that came of age in the late 1960’s. Many feel that this is their last chance to re-live their youth and they are willing to pay for the opportunity. For example, a 1970 Plymouth Hemi ‘Cuda sold for $4,035 new and well-preserved models are routinely offered and $150,000 today. That represents and 10.6% annual return. Not a bad return considering the stock market has returned 7.4% annual over the same period. Similarly, and 1970 Chevy Chevelle SS convertible with a 454ci engine sold for $4,200 new and to will cost around $115,000 or a 9.7% annual return. Finally, a 1969 Boss Mustang with a 429ci Engine originally cost $4,150 and today trades for $115,000. That is a 9.6% return over the same period. Granted these are examples of the rarest and most sought after muscle cars. However, even “common” muscle cars have experienced notable gains. The 1970 Plymouth Road Runner with a 440ci engine sold for $3,500 and today trades at $55,000. A 1967 Pontiac GTO cost $3,750 and now goes for $45,000. That’s a 6.8% compounded rate of return. The investor in muscle cars must consider a few very important points. First, all investments have risks. This market, like real estate or technology stocks, could fall as fast as it has risen. Second, unlike stocks and money market investments, muscle cars do not pay dividends or interest. Indeed, they cost money to maintain, store and restore. Third, rarity matters. As the numbers above show, the rarest muscle cars have preformed the best. Finally, get a second opinion when considering a classic muscle car. Mechanics are a good choice and a mechanic that has actually restored a few cars is the best choice. Nothing beats experience. Obviously, one of the most important variables to consider when considering muscle cars as an investment is the condition. Only the most original and accurately restored examples fetch these prices. More common versions or cars in lower conditions will sell for significantly less. For the collector that actually wants to drive their cars regularly these more common versions may actually be a better value. The choice of a rare collector muscle car or a common daily driver depends on the budget and the purpose of the collector. Both offer unique benefits to the owner and much enjoyment. The chance to re-live our youth is always a pleasant experience. 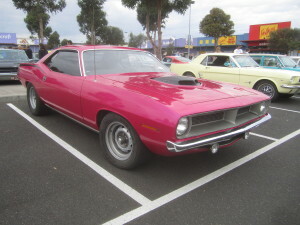 Muscle Cars [http://musclecarfacts.net/] is dedicated to providing information on all the great muscle cars of the past.